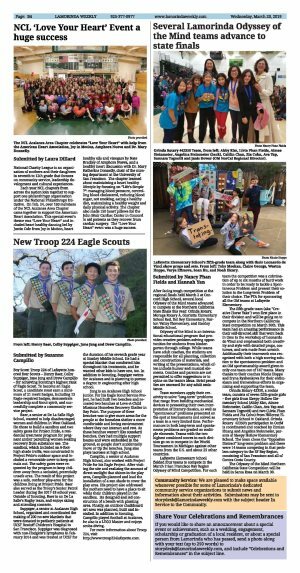 Boy Scout Troop 224 of Lafayette honored four Scouts - Henry Baer, Colby Suppiger, June Jung and Drew Campillo - for achieving Scouting's highest rank of Eagle Scout. 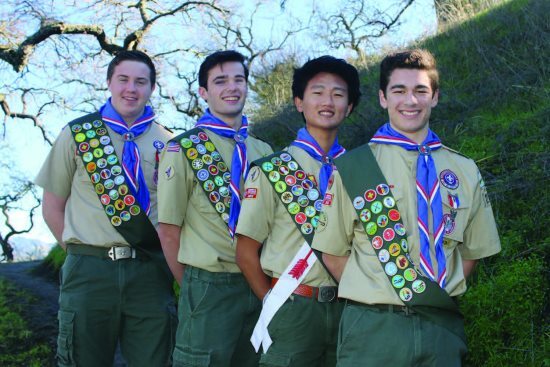 To become an Eagle Scout, a candidate must earn a minimum of 21 merit badges, including 13 Eagle-required badges, demonstrate leadership and Scout spirit, and successfully complete a community service project. Baer, a senior at De La Salle High School, wanted to help disadvantaged women and children in West Oakland. He chose to build a sandbox and two safety gates for Project Pride, a residential treatment program for pregnant and/or parenting women seeking recovery from substance use. The sandbox, which included an 8-foot-high shade trellis, was constructed in Project Pride's outdoor space and included a removable cover to keep animals out. The safety gates were requested by the program to keep children away from a secluded, potentially unsafe area. The result of this project was a safe, outdoor play-area for the children living at Project Pride. Baer also served as the Troop's Senior Patrol Leader during the 2017-18 school year. Outside of Scouting, Baer is on De La Salle's Rugby team, and enjoys skiing and attending concerts. Suppiger, a senior at Acalanes High School, organized and coordinated the making of 200 no-sew blankets that were donated to pediatric patients at UCSF Benioff Children's Hospital in San Francisco. Suppiger was diagnosed with non-Hodgkin's lymphoma in February 2014 and was treated at UCSF for the duration of his seventh grade year at Stanley Middle School. He had a special blanket that comforted him throughout his treatments, and he wanted other kids to have one, too. In addition to Scouting, Suppiger swims for Acalanes and is planning to pursue a degree in engineering after high school. Jung is an Acalanes High School junior. For his Eagle Scout Service Project, he had built two benches and recoated two benches at Love-A-Child Missions Homeless Recovery Shelter in Bay Point. The purpose of these benches was to give more areas for the people at the homeless shelter a more comfortable and loving environment where they can interact and rest. As these benches weren't like standard benches, they had multiple support beams and were embedded in the ground, so people don't accidentally move or tip the benches. Jung also plays lacrosse at high school. Campillo, a senior at Acalanes High School, also worked with Project Pride for his Eagle Project. After visiting the site and realizing the amount of direct sunlight that shines in the play area, Campillo planned and lead the installation of a sun shade to cover the play area. His project also addressed the mothers need to have a place to sit while their children played in the sandbox. He designed and led construction of a bench with planting area. Finally, an outdoor chalkboard art area was planned, built and installed. In addition to Scouting, Campillo played football at Acalanes, he also is a LEGO Master and enjoys scuba diving. For more information about Troop 224, visit http://www.troop224lafayette.com.